Choopa Review 2019: Is Choopa a Good Hosting? Choopa offers dedicated servers with a 100% network uptime and 0% packet loss guarantee. Don't be fooled by their low prices as their configurations are somewhat basic and you'll pay significantly more to build a usable server. 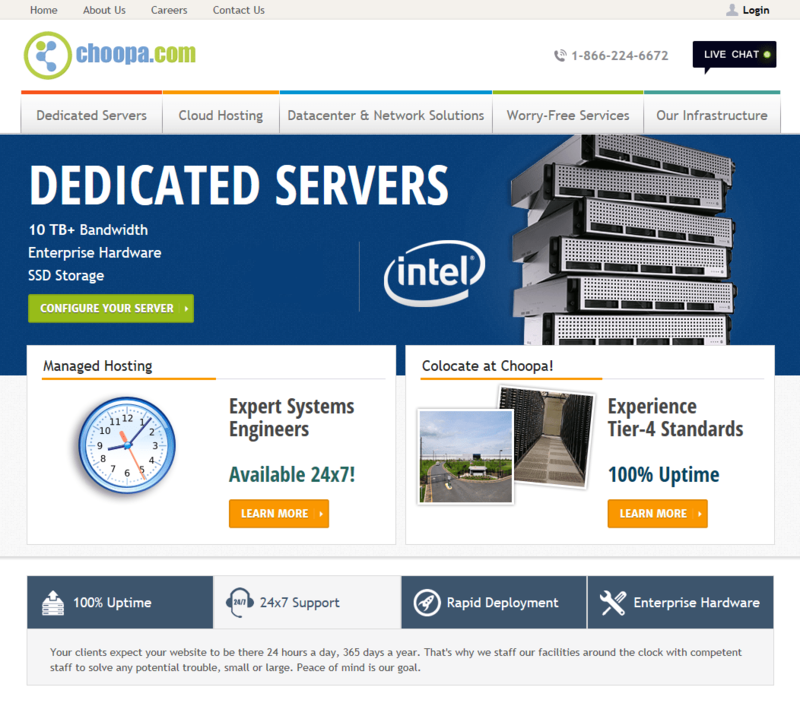 Choopa is a U.S.-based IT solutions company offering a variety of VPS and dedicated server products. Their dedicated servers come with both a 100% network uptime guarantee and a 0% packet loss guarantee. They also provide users with a 24/7/365 hardware replacement guarantee and the highest level of priority support in the event of equipment failure. While their servers appear inexpensive, you get a fairly barebones package and have to pay up to get the services you’ll need. Also, you get 100% native IPv6 support on all servers along with secure data center facilities in New Jersey. Their data center has redundant power backups with instantaneous fail-overs, state-of-the-art HVAC temperature control systems, and experienced technical staff that will ensure continuous uptime. If you’re looking at a dedicated server, then you should know how to maintain a server. Otherwise, you need to go with a provider that offers shared hosting. You can order a system pre-installed with cPanel and all the necessary software, or take care of all installations yourself. Choopa offers multiple dedicated server options featuring Quad, Hexa, or Octa-Core processors and 10 TB of bandwidth. Their Haswell and Skylake setups come with 16GB of RAM standard while the Intel servers come with 32GB of RAM standard. The initial setups for these servers appear reasonably inexpensive on the surface. That’s because outside of RAM and bandwidth, there are few features included by default. Your final cost will vary dramatically based on your desired server configuration. Note that Choopa does list VPS services on their website, but their services are actually offered through VULTR. They appear to merely be a partner for VULTR and don’t offer VPS hosting services directly. Choopa offers solid support, namely through a 24/7 toll-free hotline, a ticket system, and email. Note that their live chat support is only for sales. They also don’t offer a knowledge base, so if you need any help on how to configure your server, you’ll have to look elsewhere. If you’re looking for a solid basic setup for your dedicated server, then Choopa is an excellent place to start. Their uptime and packet loss guarantees are among the best in the industry. Wondering how Choopa stacks up against other Web Hosting companies? Enter any other Web Hosting company and we will give you a side-by-side comparison.